We departed Dunbar in the chill breeze of an early Scottish summer’s morning. The sun periodically shone through the cloud as the trawler, engine droning, bobbed its way steadily across the North Sea towards Bass Rock. As we exited the quaint harbour of sunny Dunny in the morning haze, a large lump of volcanic rock could be seen rising from the sea, about 11km distant. I sat on a damp bench in the back alongside two trays of recently landed mackerel. We were a small group of photographers accompanied by the island warden, Maggie Sheddan. From a distance, the summit dome of the Rock appeared to be covered in light snow. As we grew closer, our perception of snow turned to guano. After all, we were heading for a bird sanctuary. As we came closer still, I was gripped by the primordial appearance of the scene before me. Whilst there was indeed, guano, the prominent white blanket covering the Rock was in fact an immense assembly of mostly-white seabirds. There were also literally thousands of birds in the air, all circling the island in a clockwise direction. The scene, described by some as, ‘a wildlife wonder of the world,’ was simply jaw-dropping. Tourists visit this rock in large numbers, most taking boat trips from the nearby seaside town of North Berwick. Landing on the Island is, however a different proposition, posing a significant challenge in anything but the calmest weather. Bass Rock is over 100m tall and surrounded by precipitous cliffs on all but the southwest aspect, where the ground is still very steep. There is an unmanned lighthouse dating back to 1902, the ramparts of a ruined castle and a small chapel, both potentially dating back over 600 years. More importantly, and the reason for our visit, it hosts the largest colony of Northern Gannets anywhere in the world. Between April and October, the breeding season, there can be well over 150,000 birds occupying cramped nesting sites. 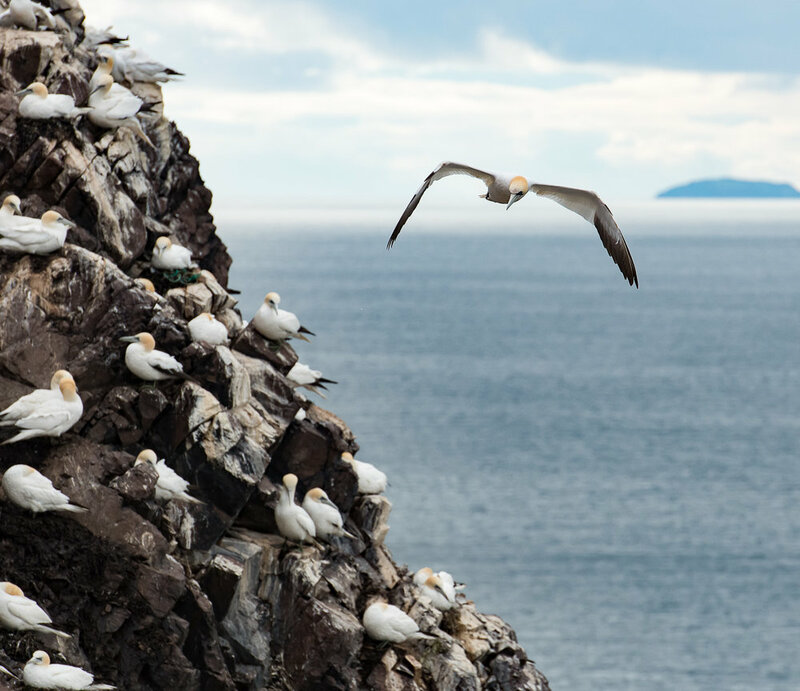 These amazingly graceful creatures are the largest seabirds in the British Isles. They have a 2m wingspan, are predominantly white, distinguished by their black wingtips, silver-grey eyes in a blue surround and honey-yellow feathers on the nape of their neck and head. They have large, long, pointed beaks designed for grasping slippery fish. We visited in June and found the lower slopes occupied by a small number of nesting cormorants; shags and herring gulls. I was attacked by one of the latter, striking me without warning, a hammer blow to the head with its open beak, drawing blood as it did so! We found several inches of soft mud; guano and unwanted feathers. There was a pervading stench, and constant cacophony of harsh, ‘krokking’ bird calls. The steps to the study site alongside St. Baldred’s ruined chapel were precariously uneven, and only loosely protected with a timeworn guardrail. Maggie did her best to help clear a way through the mud. This is not a place for people with mobility difficulties. I spent the first few minutes of our four-hour stay absorbing the spectacle. 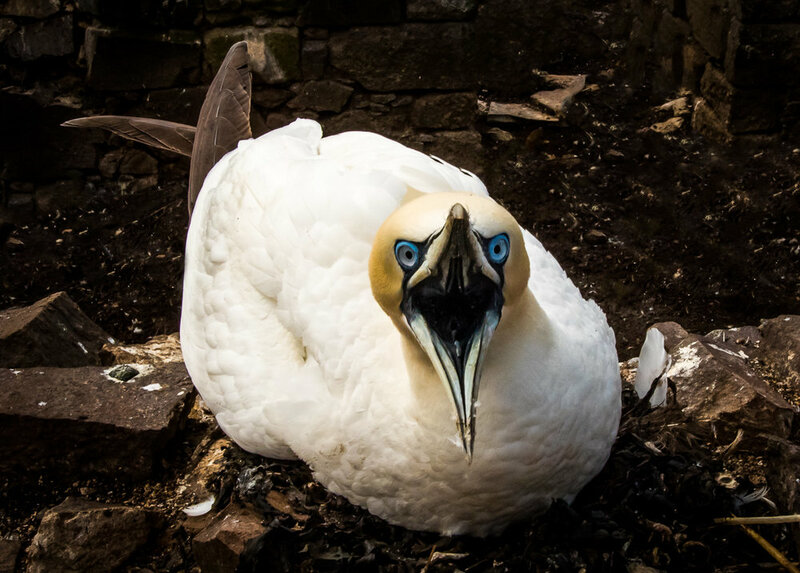 On the upper slopes, within a few feet of where we stood, nesting gannets covered every inch of ground, each jealously guarding their pitch from predators including, of course, over-enthusiastic photographers who get too close. They fenced and jabbed at our legs with their terrifying open beaks, guttural squawk and glaring binocular eyes in bright blue rims. 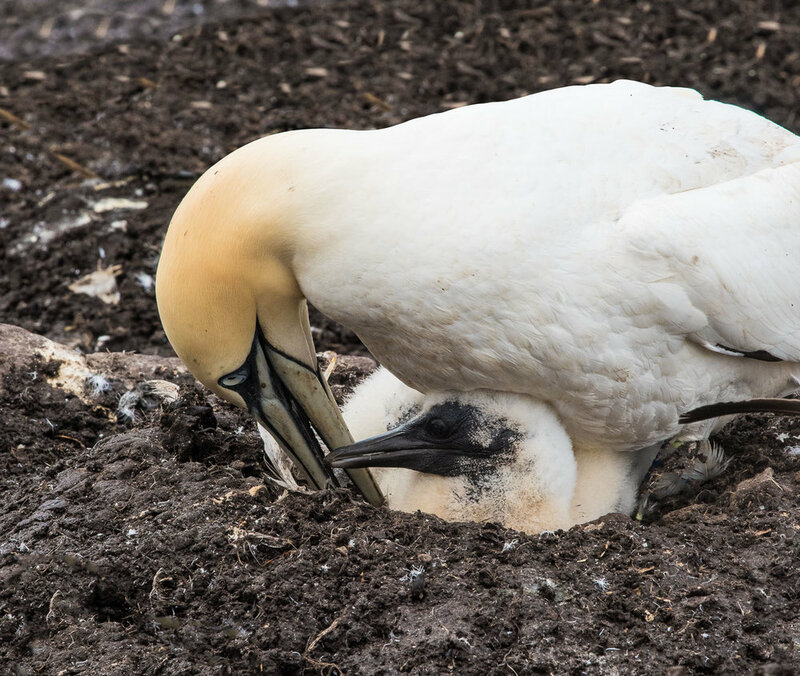 Thankfully, committed to their parental duty, they remained glued to their nests; each of which was predominantly comprised of salvaged seaweed and constructed to insulate their egg or young chick from the cold, damp ground. 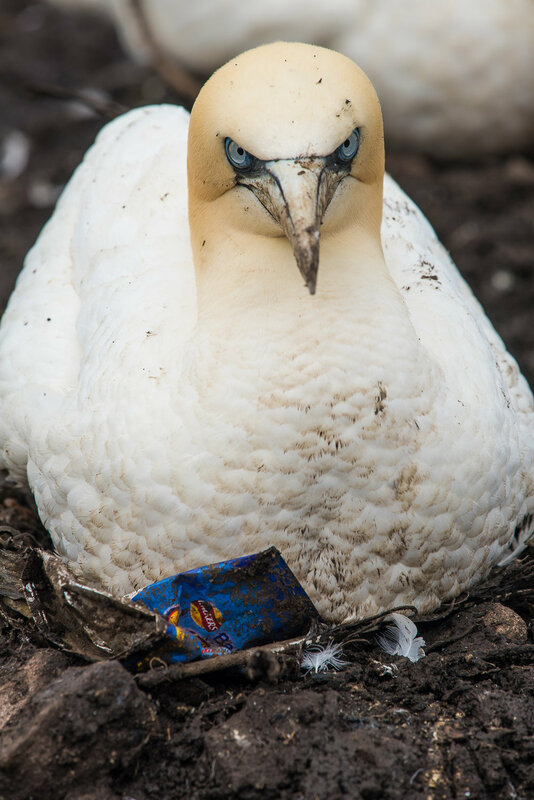 These birds will also, however, employ anything else they can get their beaks on, including discarded human garbage, such as old fish nets; plastic bottles and crisp packets. One or other of the mated pair will be constantly coming and going, sharing the task of foraging for food or materials for nest building. There are no visible distinguishing features allowing determination of gender. When the partner returns after more than an hour or so away, they will greet one another, heads raised and pointed skyward, with a display of gentle beak tapping. They take it in turns to incubate the egg or mind their offspring, sitting the same on their webbed feet; the warm blood flowing through their mint-coloured veins, helping to keep the egg or young chick warm. 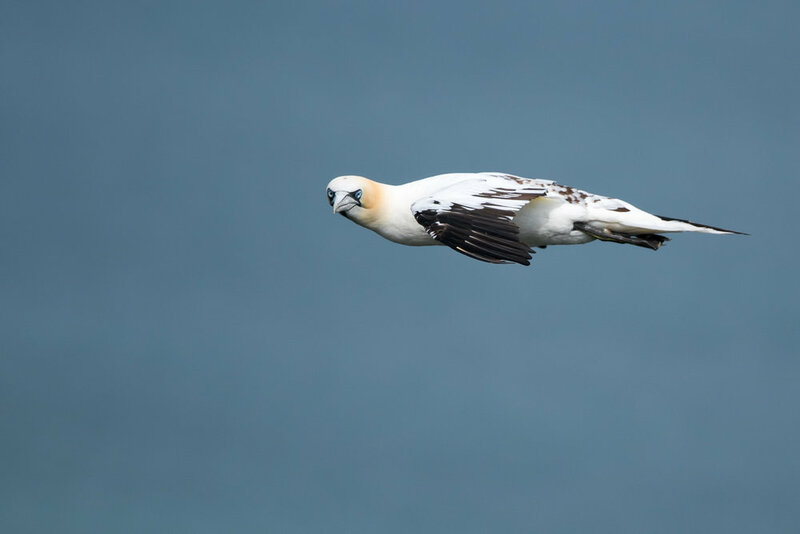 On land, gannets are clumsy and ungainly. 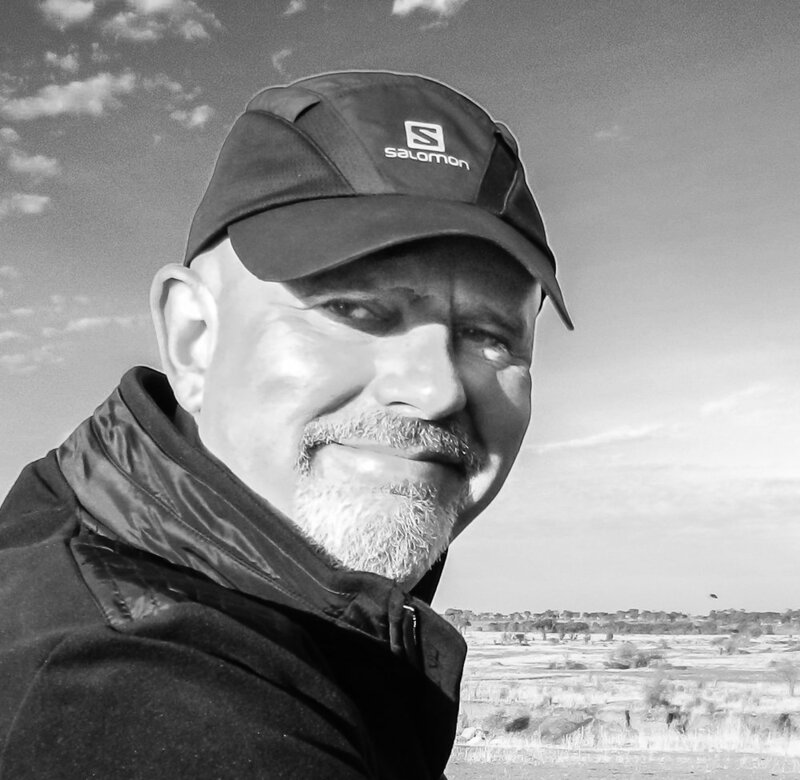 Returning home, they frequently crash-land onto the general area of the nesting site and find themselves pecked at by their territorial neighbours as they run the gauntlet of other nests, until they finally locate their own. Prior to take-off they will point their beaks upwards for a few seconds in order to notify their partner of their intention to depart, ensuring the egg or young chick is not left alone by both birds leaving at the same time. One also imagines that the bird is seeking a gap in the airspace to safely proceed without colliding with others, for there is no air traffic control here. On a still day, gaining sufficient lift for a smooth take-off, even from a cliff-top site, proves difficult. The feat is achieved with a vigorous and clumsy flapping of wings. Once airborne, however, it is a different story. These are incredibly elegant beings, capable of fine manoeuvres in flight. Unlike most other birds, their eyes are angled to the front so that they can observe the sea beneath them in preparation for their speciality, fishing by plunge-diving. 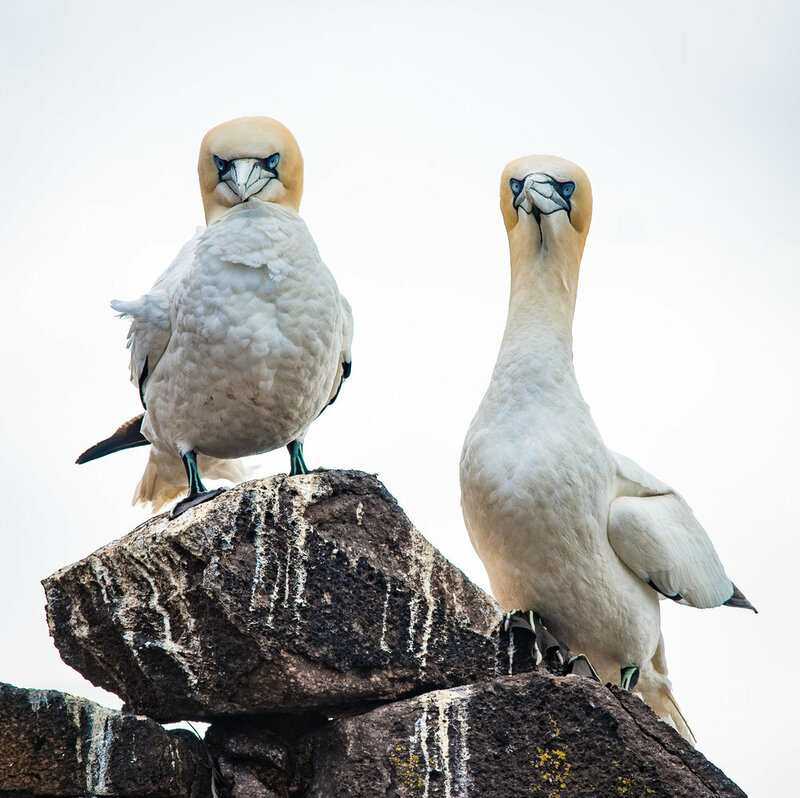 Gannets patrol the seas in the vicinity of their nesting site although recent studies indicate they may range as far as 500km in a single day, occasionally remaining out for up to 48 hours; sitting on the water overnight to rest. 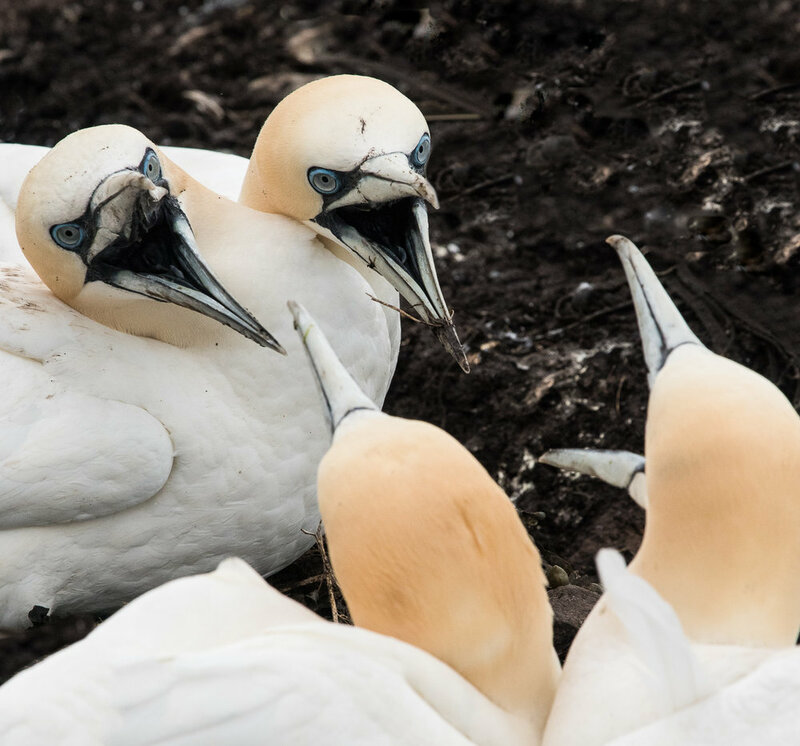 Despite their territorial behaviour and occasional squabbles, gannets are highly social creatures on land and at sea, choosing to nest and forage in large groups. When they spot a shoal of fish they dive to catch them. Depending on the depth of the shoal, they can dive from a height of 40m and hit the water at speeds of up to 100kmh, and using their webbed feet and wings for propulsion, reach depths of 10m. They have air sacks in their neck and breast and pockets of suitably located fat, protecting them from injury that would otherwise be caused by the velocity of their collision with the water. Further, just prior to impact, they retract their wings, striking the water like a missile. 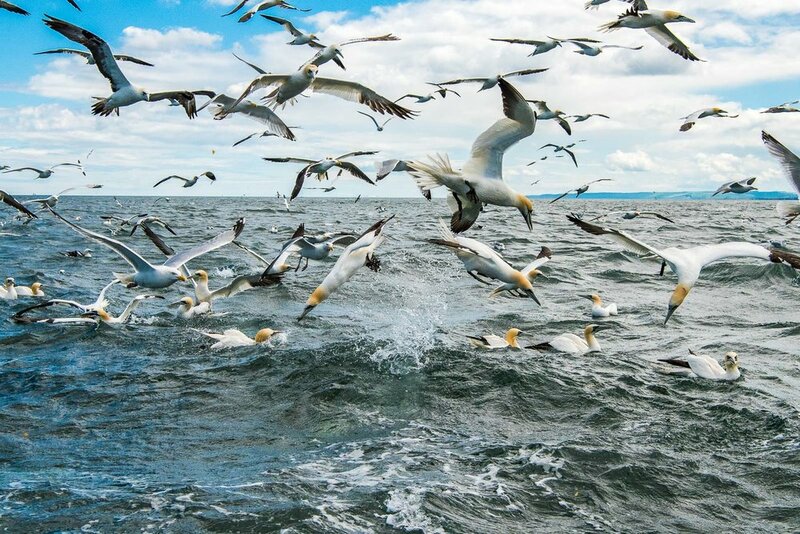 Where there is a large shoal, there may be dozens of gannets diving at the same fishing ground and gannet colliding with gannet at high speed is an occasional cause of serious injury or death. Further, each will try to consume their catch underwater and evade their companions when they resurface, to avoid being mobbed by others trying to steal their precious cache. When the fish are nearer the surface, they dive at a shallower angle from a few metres above the the water and do not always fully retract their wings. They may dive as many as 130 times a day to obtain sufficient food for themselves and their young. 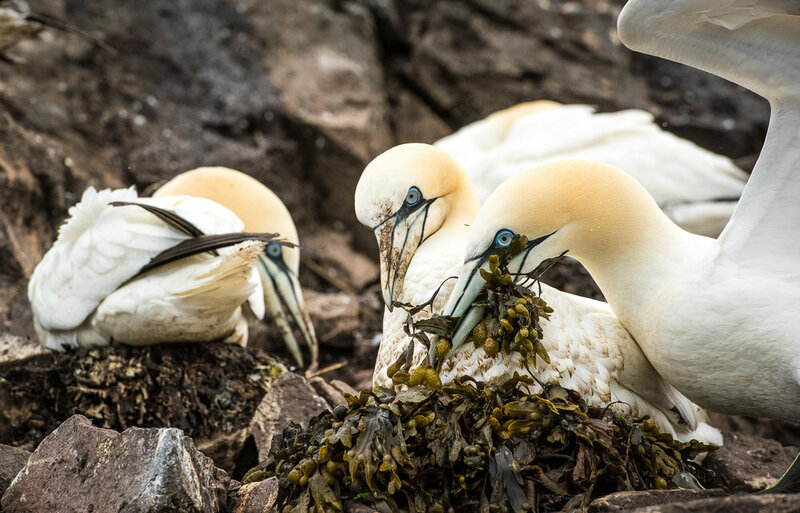 Gannets mostly eat herring and mackerel but will happily eat other fish discarded by fishing boats, the equivalent of junk food. They eat twice a day; once in the morning for themselves and in the evening to provide a take-away for their chicks. 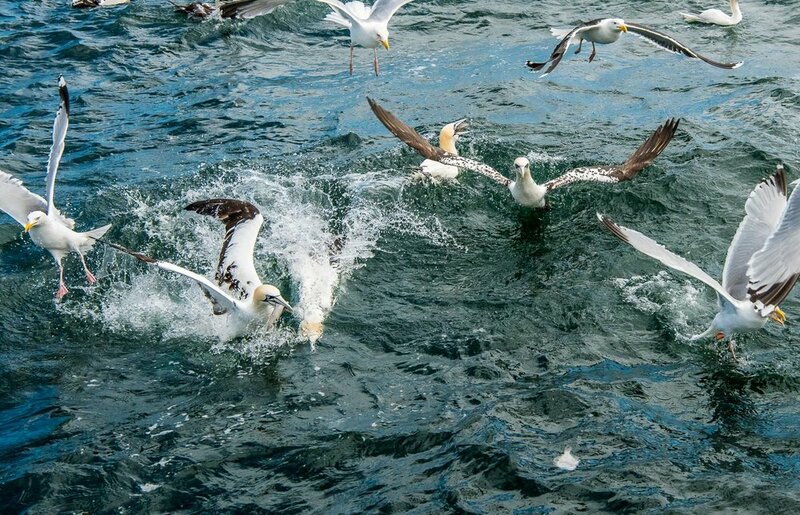 Herring and mackerel fisherman for their part, will look for gannets amassed in large numbers over the sea to indicate profitable fishing grounds and set the depth of their nets according to the heights at which the birds dive. This tacit co-operation between humans and seabirds, harvesting the bounty of the ocean, amounts to something of a quid pro quo. 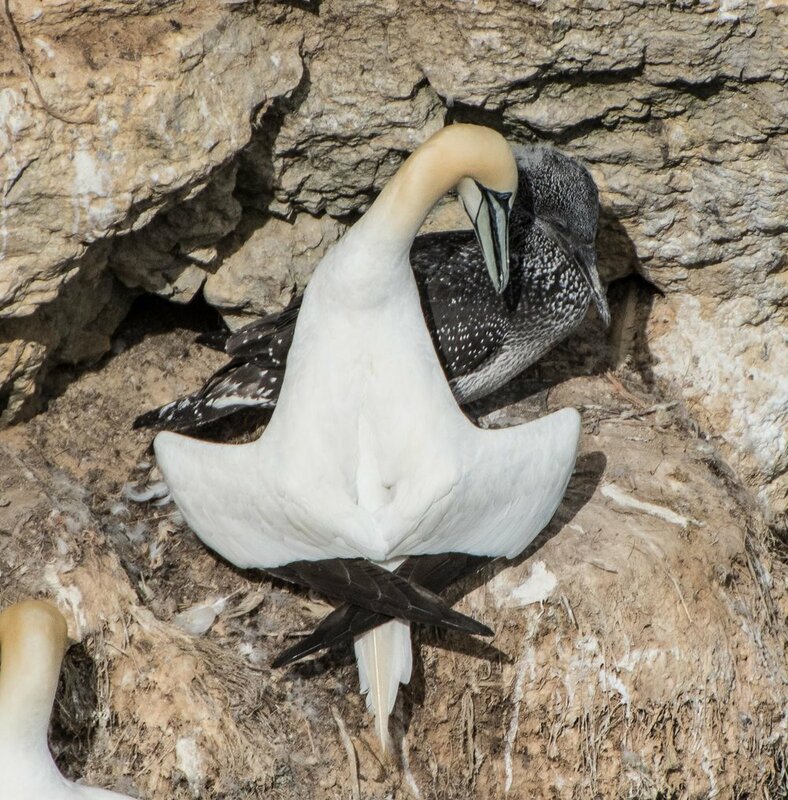 Each gannet pair has one chick a year that will hatch after 6 weeks incubation. At the time of my visit a few mating pairs had young chicks, some covered in fluffy white down, others, just a couple of days old, were bald and rather scrawny. As the parent returned to the nest with a fresh fish stored safely in its crop the youngster opened its beak expectantly. The adult in turn, enveloped the head of the chick with its beak and regurgitated the meal for the hungry baby. The Northern Gannet can be found at several sites around the UK. All of which are chosen for a ready supply of fresh fish; their lofty aspect to aid flying and an absence of predators. Notwithstanding, herring gulls will raid an unguarded nest and steal any eggs or chicks they find. If the parent is present and unable to fend off the attack, it will instantly regurgitate any caught fish from its crop. This is normally sufficient to distract the gull, who would rather eat the fish. 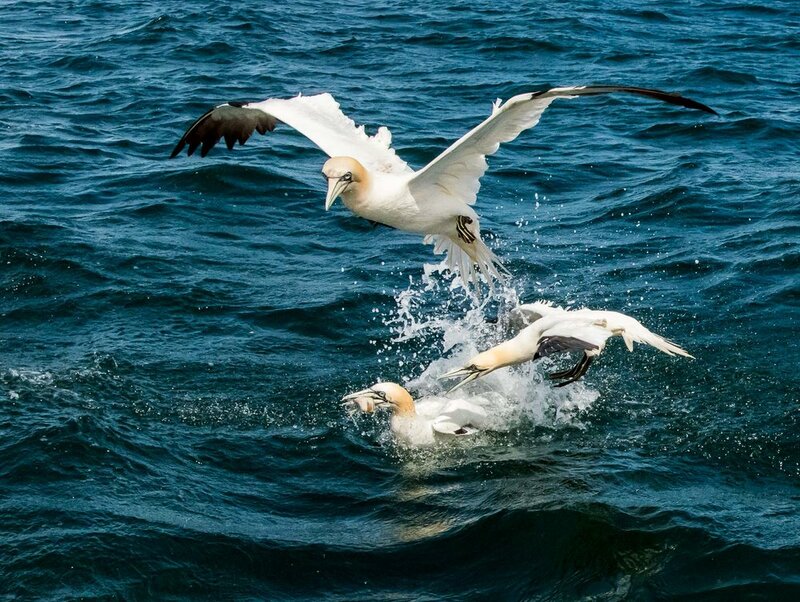 Neighbouring gannets will not normally assist or intervene, for fear of exposing their own young to harm. As the chick grows, the white down is shed and the young fledgling will have almost entirely black plumage. After about four months, when it is assessed to have sufficient confidence and strength, the parents will allow the young bird to fend for itself; whereupon hunger eventually provides the motivation for the adolescent to hurl itself from the cliffs and fly down to the water to find food. At the end of the breeding season, the gannets migrate to the warmer climes of west Africa for the winter months. When they return the following spring, the juveniles occupy land at the fringes of the main nesting and breeding area. In these bachelor colonies, birds may find mates and even attempt breeding although they will not succeed at this young age. With time, they acquire a dappled appearance gradually growing white feathers and shedding the black. Over a period of 3-4 years the speckles decrease until they have the same all-white body feathers of an adult bird. Some pairs mate for life, although recent studies suggest that as many as a quarter will divorce within ten years. 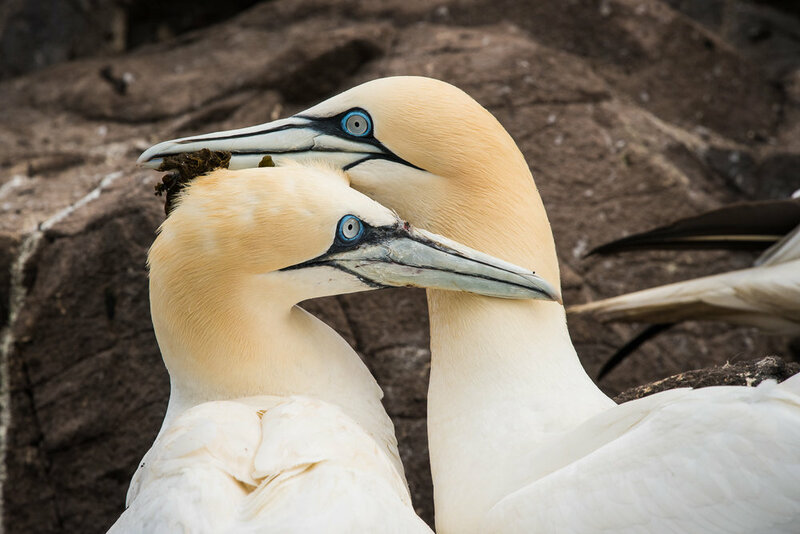 Gannets have a life expectancy of up to 50 years. Later in the year I visited another gannetry at Bempton Cliffs in North Yorkshire. 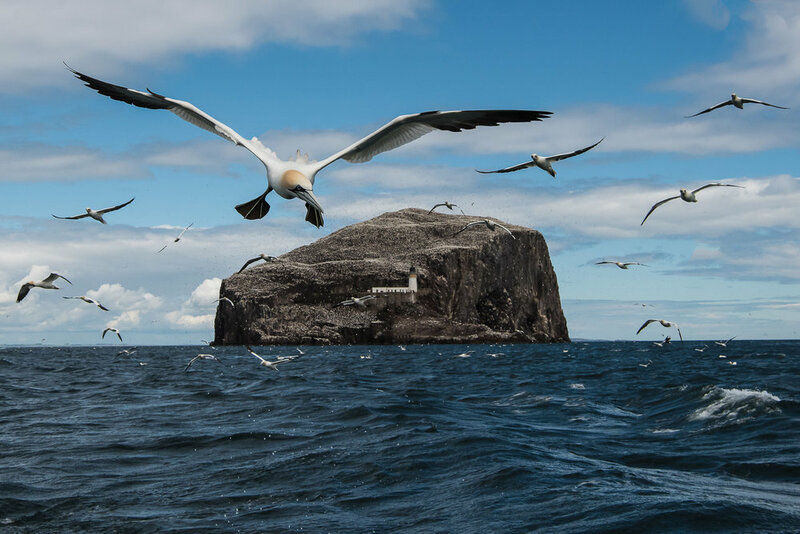 Although somewhat smaller and less spectacular than Bass Rock, it provided an opportunity to see older chicks some of whom would soon fledge. Only a few still wore their down coats and many were developing black feathers in preparation for their first flight. I look forward to visiting these creatures again soon. Back on Bass Rock, the wind was picking up and we were urged to start packing our gear. By the time we came to depart I had developed a throbbing headache from my unfortunate, earlier encounter with the gull and there was a substantial sea swell. All was not good! Re-boarding the fishing boat became an adventure in its own right. One of the fishermen sustained a serious injury to his finger whilst trying to fasten the boat to a mooring point in the rough sea and it took over half an hour and several attempts to embark all the photographers on the vessel. On our return journey we fed the birds from the crate of mackerel that had kept me company during the outward leg. 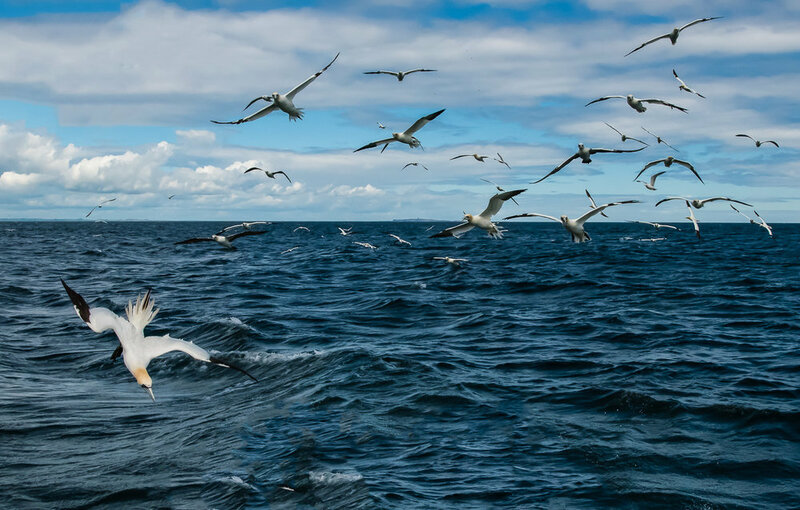 A huge congregation gathered close to the rear of our boat and we were treated to a spectacle of plunge-diving and squabbling by the gannets and gulls as they competed for the catch. We had an amazing day and I look forward to returning some time soon.